Most people would say the state of Colorado’s best natural assets are the Rocky Mountains. When it comes to golf I’d argue the best thing going for it are the high prairies along the eastern Front Range. The mountain courses, visually dramatic and non-replicable anywhere else, are often difficult to build and unyielding to play and walk. They can achieve high marks for memorability but have to be judged within their own narrow and compromised context. The rolling terrain, arable soils, winds, creeks and native grasses of the high plains at the base of the foothills are more naturally suited to golf. Architects who know what they’re doing don’t have to manipulate the land much to create natural, compelling hole structures, and since there’s plenty of space (or used to be) the golf usually comes in at an affordable price. The design embraces the natural ground momevement like here at the 7th. Murphy Creek east of Denver incorporates all of the above. The design roams over the land at the edge of civilization using the site’s contours and fall lines in imaginative ways. 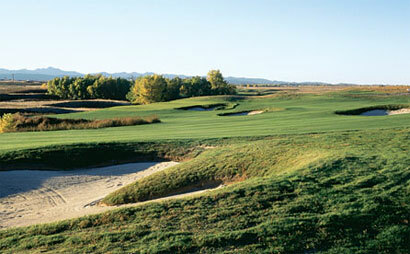 Ken Kavanaugh’s bunkering looks great against the vast backdrop of the Front Range. The bunkers also function as guideposts to alleys, ridges and high-risk zones that open up lucrative angles into the greens. An eponymous creek and several gulches are put to good use, like the one that cuts across the green at the par-3 11th and continues on as a diagonal driving hazard at the 12th, a long par-4 with a wide, fast fairway. The creek also forms the inside corner of a sharp dogleg at the 348-yard 9th (311 from the men’s tee). Several lines of play are presented, ranging from safe shots to a fat of side of the fairway (dotted by three bunkers) to incrementally more risky options that culminate in take-dead-aim route to the green directly over the creek and brush (driving the green, at this altitude, is more than a possibility). Quite a few options at the short 9th. A reversal of the nines would improve the course. They probably wanted a big hole to finish the round, and the current 468-yard uphill 18th qualifies. 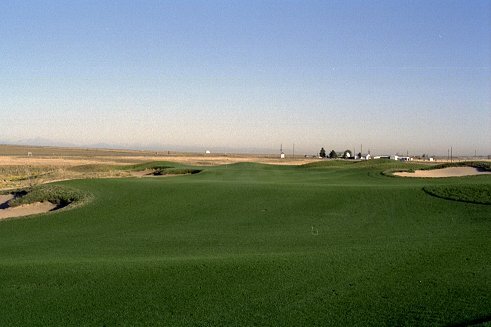 But 14 through 16, turning through the thick of the adjacent housing development with two holes hugging retention lakes (Coloradoans love water features because they see so few of them), are the three weakest holes on the course, and the par-3 17th is just long rather than good. These would be better gotten out of the way mid-round.